Pay-Per-Click (PPC) Management Improve ROI & your bottom line. Pay Per Click advertising can drive relevant and targeted traffic to your website immediately. PPC ads are shown as ‘Sponsored Results’ at the top and side of the main search results in Google & Bing search engines. You can literally start attracting potential customers searching for products and services within a matter of minutes upon setting up a PPC account. Paid advertising can be powerful marketing tool when done right. Pay-Per-Click (PPC) Management Reduce CPC, Increase Visibility, Attract New Customers. Our effectively managed PPC campaigns can reduce you CPC (cost per click) for your targeted keywords. We strategically select valuable keywords and phrases to gain website traffic from potential customers ready to buy your products or services. For every £1 spent on your PPC campaign we aim to gain £3 ROI. Our paid experts can maximise your PPC budgets. Targeting the right audience when they are searching online ensures that you don’t end up burning through your budget without seeing positive results. It’s extremely fast, reliable, and guaranteed way to get you positive results when implemented correctly. We can happily take over existing PPC accounts or create new campaigns that can provide ROI. Keywords, Industry & Competitor Research. We conduct in-depth research of your current keywords, competitors and your market for your PPC campaign. We also identify keywords which might be indirectly associated with your business as well. The data we gather allows us to identify and strategically select valuable keywords and phrases, tailored to your business. This allows us to formulate a strategy that will limit your costs, boost your sales and generate traffic and ROI. We will either setup/rebuild or restructure your pay per click layout, settings, ad groups or ads to allow us to quickly identify which ads are bringing in ROI. We will create unique, compelling and engaging adverts tailored for your business. These may include display banner ads, text ads and ad extensions like phone numbers, site links and/or Google maps where applicable. Depending on your business and industry we can also add in dynamic elements that can be used for promotions. We’ll also launch dedicated landing pages for your ads to provide the relevancy for each ad and campaign. Your campaigns will be integrated with Google Analytics to track all progress and ultimately ROI. Manage, Add and Replace for Campaign Exposure. Our experts will manage your account on a daily basis to maximise your campaign efficiency to improve return investment. We will also monitor your competitors to identify any new opportunities and react to trends. We will tweak, test and optimise your campaigns to use negative keywords, manage budgets and alter bid costs to maximise your overall budget spend. Enhance and Maximise Conversion of Ads. 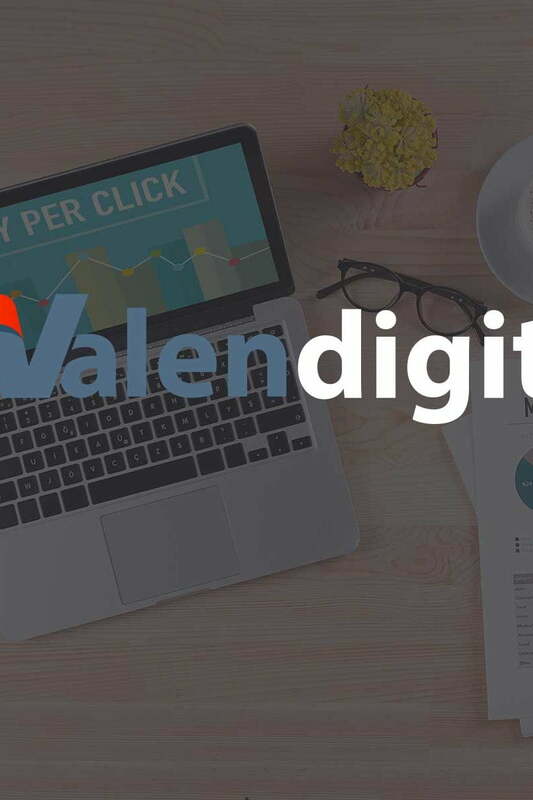 Valen Digital will setup conversion goals to further identify which ads are delivering the best results. We will deploy a/b split testing on your ads to identify the better performing ads. We will also setup GEO targeting, time schedules and/or cross device conversion and attribution depending on the type of ad campaign required. Strong CTA (call to actions) and dedicated landing pages will ensure maximum ROI and the best results possible. Google paid search listings appear at the top 3-4 positions and right hand side when a user inputs a search query. The rest of the listing that are displayed are from naturally organic search results from other websites. Your Google Adwords campaigns will be designed and structured to display your text ad, which has your description and your website link for the keywords used in your PPC account in the paid listing locations. When a user clicks on one of the paid listing ads you will then be charged a fee per click (CPC) depending on the cost associated with your industry and competitiveness of the keyword being used. These text ads can also be used effectively with a Google shopping integration which is brilliant for an ecommerce site. Your ecommerce feed will be used by your Google shopping account which will then display ads above the all the normal and paid search results. Google’s display network allows your business to display text, image and /or video ads on other 3rd party websites within the Google display network. You can choose from various options like GEO targeting, demographics and timing as to when your specific ad will appear. This ensures that your ad will appear only to the users that are relevant to your product or service. Google Adwords also allows you to use Remarketing. When a user visits your website a small cookie or tracking code is placed onto their computer. That same visitor is then showed your ad when they visit other websites ensuring that they are reminded of your brand, product or service. This reminder helps the visitor to convert on your website when they are ready to do so. Remarketing can have a significantly higher conversion rate when its combined with other methods that are used.